St. Matthew’s Episcopal School has a long-standing commitment to the arts. In its third year, the Spring Art Show has evolved into an outstanding event for the students, their families, and the community. The beautiful oak trees along Barrow Street and Parish Hall will be the setting for Art Under the Oaks – a student art show and celebration of all the arts. The event includes a Patrons’ Party for adults only, student art work for sale, auction items, teacher treasures, a live auction of class projects, artists’ demonstrations, local artists’ works, a cash bar, and entertainment by Les Bon Temps! The masterpiece showcase will take place on March 22, 2019. St. Matthew’s Episcopal School has a long-standing commitment to the arts. In its third year, the Spring Art Show has evolved into an outstanding event for the students, their families, and the community. This year, the beautiful oak trees along Barrow Street and the newly constructed Parish Hall will be the setting for Art Under the Oaks – a student art show and celebration of all the arts. The masterpiece showcase is scheduled for Thursday, April 28. Tonight is our fabulous event, Art Under the Oaks! If you haven’t purchased tickets yet, you can purchase them at the door for $5. Each ticket purchased also gives you a chance to win a $500 tuition credit or door prize! Complimentary childcare will be provided in the Aftercare room for those attending the Patron Party. Detailed below you will find some of the events and opportunities that will be featured at Art Under the Oaks. Don’t forget to check out the individual student artwork and class art projects! There will also be a photo booth & face painting. ***KEEP AN EYE OUT FOR GREEN BID SHEETS. THOSE ITEMS HAVE A “BUY IT NOW” OPTION! Sign-up for these events early on Friday night; spots are limited and will sell out quickly! • Enrichment Teachers For The Day • Chartered Fishing Trip For the Rodeo • Private Tour of a Sugarcane Farm & Refinery, truck ride & lunch • PJ’s Barista For The Day • HTV News Anchor For The Day •Chick-Fil-A Manager For The Day • Experience POV For The Day • Twisted Fitness Instructor for the Day • Hair Stylist For The Day • Yoga, Wine & Cheese Party • Workout 360 Membership • KidCam Camp• Cover Model for Family First Magazine & Professional Photo Shoot • Professional Will Service • Professional Home Staging • Private Reformer sessions • 1 hour massage • Dinner Party at TX Roadhouse • seasonal cheesecake delivery •MIRAPeel •church photographs by Mr. M •salon services by Salon Rubicon • vintage Jazz Fest posters • oyster cross • traditional & contemporary artwork • auto detailing • Vera Bradley bag • wine basket • picnic set • teepee reading nook • handmade aprons • Waterford crystal • science kits • book baskets • Star Wars baking set • Sign Gypsies yard greeting • Easter basket • Raising Cane’s gift basket • TX Roadhouse gift basket • Charles River raincoat • Mary Kay • Blooming Orchid wreath • soft shell crabs • animal print jacket & bag • vintage side table • SMES Yearbook & ad • 2019-2020 SMES t-shirts • espresso maker •& Much More! Reserved Seating & Parking For SMES Events (Concerts, Closing Ceremonies, Graduation, Grandparents’ Day) • name the carpool drive on Belanger St. & Gabasse St. (ex: Molly Lane; look for the official street sign tomorrow night!) • dinner party in your home catered by our #1 chef, Mr.M •& more! Don’t miss this fun WINE PULL; every pull wins! Draw a cork from the bowl & find the matching prize! Each bag includes a $25 restaurant gift card AND a bottle of wine. Thank you to our wonderful sponsors! You can help us show appreciation by supporting these local businesses. Thank you to our special donors who have donated goods and/or services! 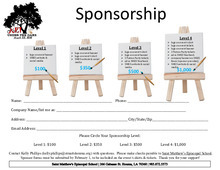 Art Under the Oaks is an excellent opportunity for local businesses and individuals to promote and market their businesses, products, or services while supporting education and the arts in the Houma-Terrebonne community. If you or your business is interested in taking advantage of this wonderful opportunity, please complete sponsor form and send it to St. Matthew’s Episcopal School. Each tier of sponsorship affords the sponsor unique levels of visibility at the event and throughout the community. I hope that you will seriously consider this wonderful opportunity to partner with St. Matthew’s as we strive to make the school and our community stronger. Please know in advance that all donations are greatly appreciated and that you, your families, and your friends are invited and encouraged to join us for Art Under the Oaks. I look forward to hearing from you soon and to seeing you at Art Under the Oaks on March 22!